Even as a kid, Rockefeller Center thrilled me and it still does. It seemed to me the center of the civilized world: the swanky Rainbow Room, the deco design of the towers which reached to the sky, the skaters in front of the Prometheus statue, the dressed-up office workers and shoppers, even the subterranean shopping arcades. It was a chance to brush up against the Mad Man world of the ’60s and ’70s. But I wonder how it came about. What would be the response to such a proposal today? Nelson Rockefeller calls it “A story of Planning and Building”. But it’s also a story of the promise of a new technology, of optimism and of fear, of destruction and rebirth. It’s a relic of another time and of other attitudes toward the city. John D. Rockefeller had bought the site – three city blocks full of tenements and speakeasies – with plans to demolish them for a new home for the Metropolitan Opera. 228 brownstones, with 5,000 tenants and an estimated 1,000 speakeasies, came down. 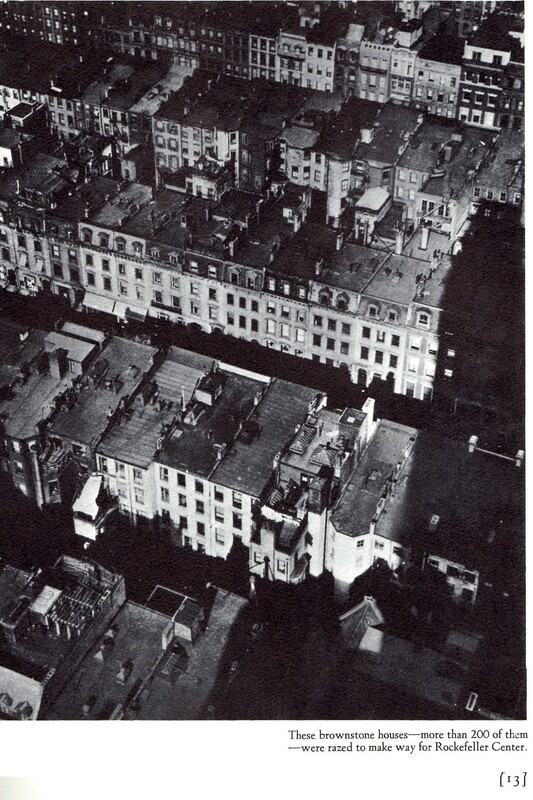 Imagine if today the family of an oil tycoon bought up a neighborhood, evicted thousands of people, demolished hundreds of brownstones, and built office towers. Those days are over. Here in San Francisco, the Rockefellers duplicated their NY success with the Embarcadero Center, but displaced only the wholesale produce market. Back to New York. The Opera decided to stay put, and Rockefeller now owned a neighborhood. Or, more specifically, Columbia University owned the site, as it still does, with a ground lease held by the Rockefellers. Fortunately for the Rockefellers, a new technology came along to serve as the economic engine of the project. Radio: the dotcom of the day. Nelson Rockefeller, again: “The answer was – radio. Opera was the great old art; radio the new – the latest thing in this contemporary world of ours, the newest miracle of this scientific era, young and expanding.” So RCA, Radio Corporation of America became the anchor of the project. Rockefeller Center: worth the bother? I admit it’s a silly question. First because Rockefeller Center exists and it’s too late to ask it. Sure there was displacement and buildings came down. Those buildings look “historic” in old photographs but most of them were less than fifty years old. A raffish enclave was lost, with its bars and whorehouses. And there was controversy about the design. Of all the people who hated the plans for Rockefeller Center–and almost everyone did–none hated them more than Lewis Mumford, writing in the New Yorker. Many of my friends would be at the barricades against such a proposal today. Great post and I agree with the conclusions. Let’s leave to Europe the nostalgy for the past. Things like the Rockefeller center are evidences of how far a motivated man can go. I’ve always wondered what was on that site. Thanks for the post, Prowler!